November storms on Lake Superior have no equal. 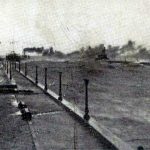 Mountainous seas, sub zero temperatures, blinding snow and hurricane strength winds these storms have caused the greatest destruction and tragedy among sailors of the Great Lakes. The last days of November of 1905 were particularly wicked. On November 26, Lake Superior was relatively calm. The previous week had unleashed a severe snowstorm keeping vessels in port. A break in weather was a welcome relief. Dozens of vessels steamed out into the lake hoping to make one more trip before the end of the season. On the morning of November 27, the weather forecast called for cold and fair conditions. At Duluth, Minnesota, the steamer Mataafa was preparing to set sail with its consort barge James Nasmyth. In command of the Mataafa was Captain R. F. Humble. Captain Humble had spent sixteen years sailing on the Great Lakes and had great confidence in his vessel. At 3:30pm, the Mataafa cleared the Duluth harbor piers with her barge. Both vessels were fully laden with iron ore destined for the steel plants along Lake Erie. Although the weather had worsened as winds began to gust with some snow flurries. Captain Humble had some reservations about the weather, but the Mataafa was a young staunch steamer that had already weathered many storms through its six years in service. The Mataafa and the Nasmyth made good progress, but the weather conditions continued to deteriorate. The gusts of wind and snow had turned into a raging blizzard. Waves crashed over the spar deck swirling down the length of the vessel. Captain Humble began to have great concern for his vessel. By 7:30pm, the two vessels were off Two Harbors, Minnesota, when the storm’s full force struck the Mataafa and the barge Nasmyth. Massive waves crashed over the pilothouse and the already limited visibility dropped down to nearly zero. Crewmen down below struggled to stay on their feet. Firemen continued to shovel coal into the boilers while the chief engineer throttled the engine as the screw was lifted and fell back into the rolling waves. On the morning of November 28, the Mataafa was still being punished by the storm. Although the vessel had been steaming for over 10 hours, the Mataafa and Nasmyth had made little headway. Captain Humble ordered the vessels to turn back to shelter of Duluth. This would require the Mataafa to fall into the trough of the waves then swing her bow around. After successfully completing the maneuver, the two vessels headed towards Duluth. Over the next several hours, the vessels inched their way along the north shore. After noon, Captain Humble was able to see the shoreline as the snowfall let up. As the Mataafa caught sight of Duluth, Captain Humble caught sight of two vessels entering the harbor. 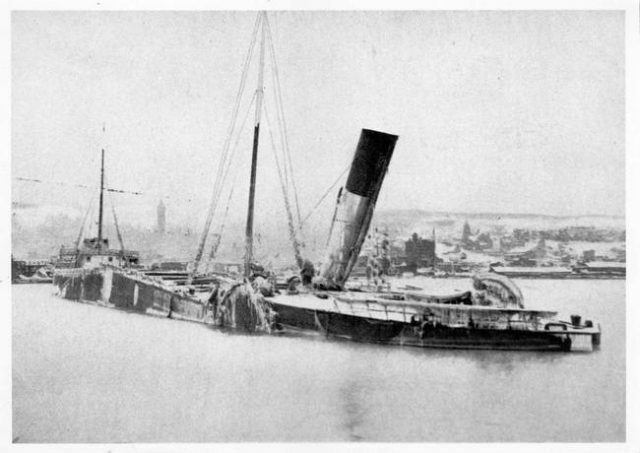 The vessels were the steamer R.W. England and the steamer Isaac L. Ellwood. The R.W. England had approached the Duluth Ship Canal when her master realized that the England was not going to make the piers. The steamer attempted to turn back into Lake Superior, but the giant waves pushed the England ashore. The R.W. England crashed ashore and eventually ended up high on the beach. Although the crewmen of the England were safe, the vessel had suffered severe damage. The Isaac L. Ellwood also attempted to enter the ship canal. 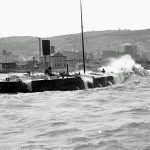 The Ellwood had spent several hours anchored in the open water waiting for better weather when the Ellwood began to take on water in its hold. Her master had no choice but head for shelter before his vessel foundered under him. 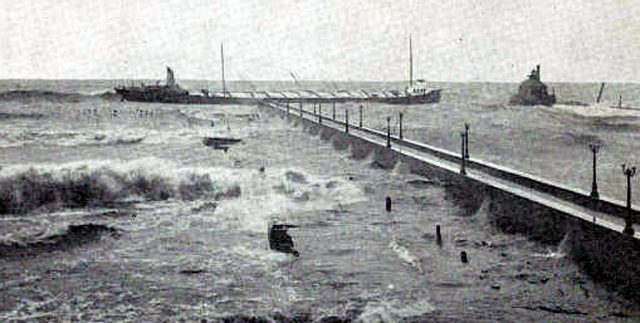 The Ellwood reached the canal by 1:00 p.m. and headed directly through the two piers. However, a large wave sent the Ellwood crashing into the north pier tearing plates in her hull. The vessel then bounced off the pier into the other south pier causing more damage to its hull, but the Ellwood continued onwards to just inside the harbor. Spectators nearby cheered as the Ellwood was pulled into the shallow waters by tugs. The Isaac L. Ellwood quickly settled to the bottom, but her crew was safe. The Mataafa and Nasmyth reached the entrance to the ship canal at 2:15 p.m., but conditions prevented bringing the consort Nasmyth through the narrow ship canal. Captain Humble ordered the towline dropped a few miles before the harbor entry piers. The barge dropped its anchors. Luckily, the anchors held and the Nasmyth rode out the storm. Captain Humble then ordered the Mataafa at full steam ahead towards the entry piers. 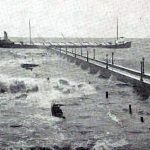 When the steamer approached the piers, a giant wave lifted the vessel so high that the bow of the Mataafa stuck bottom. The blow sent the vessel’s stern careening into the north pier. Another wave forced the Mataafa to turn perpendicular to the pier. Although the steamer still had full power, it seemed to be immobilized. Captain Humble realized that her rudder had been sheared off when the vessel struck. The Mataafa was now disabled and at the mercy of the storm. Wave after wave pushed the steamer against the concrete pier until another large wave pushed the steamer outside the pier onto nearby shallow water. Captain Humble’s gamble of entering the ship canal had gone disastrously wrong. After the Mataafa struck hard aground, it began to break in two. The stern section began to settle lower in the water. Waves washed over the sinking stern extinguishing the boilers and the only source of heat and power on the vessel. With the temperature nearly thirteen below zero and the stern breaking apart, the crewmen aft were in desperate shape. The second mate, who had been aft to help with releasing the towline earlier, decided to risk crossing the open deck to the forward section. Along with three other crewmen, the men made their way along the railing. Icy waves crashed over them nearly breaking their grasp of the thin wire railing, but three men reached forward. One crewman, after nearly being washed overboard several times, elected to join the eight other crewmen on the stern section. These men had little protection from the elements. As the winds peaked over 60 miles an hour, these sailors sought refuge under the smokestack. The remaining fifteen crewmen took refuge in the forepeak. Conditions were little better than at the stern as water careened through broken portholes and through broken doors. The men had only the heat from a few lamps. There was no food so some broke off icicles and sucked on them. Captain Humble ordered the men to stay on their feet even though they were all exhausted from the ordeal. However, there was some hope for the crew of the Mataafa. They could see the bonfires blazing along the shore through the snowstorm. Nearly forty thousand people from Duluth had gathered along the piers and beaches keeping a vigil. 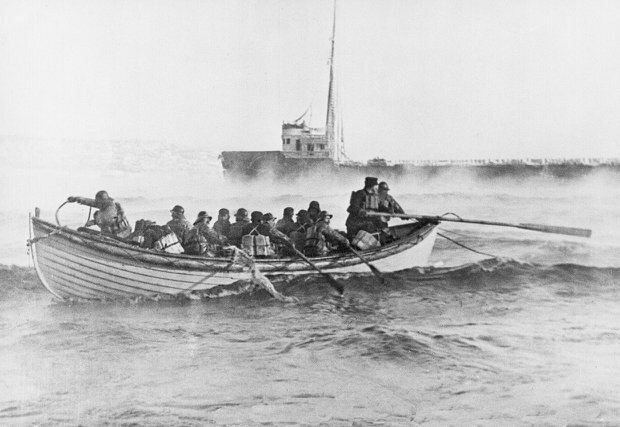 The Coast Guard had attempted to get a line aboard and rig a breeches buoy, but the line quickly froze and broke. No lifeboats or any other attempts would be made while the tempest still raged on Lake Superior. The morning of November 29 brought better weather. The wind and seas had decreased, allowing the Coast Guard to launch their boat out to the Mataafa. Captain Humble and the other crewmen forward were quickly taken off. Before Captain Humble left his steamer, he ventured back to the stern. There he sighted several aft crewmen frozen to death. Their bodies were encased by ice and had to be chopped free to be taken off the vessel. In all, nine crewmen in the stern section died of exposure or were washed overboard. The barge James Nasmyth was towed into port. Although it was battered, the vessel and crew survived the storm. Although the Mataafa was broken in two and was severely damaged, the steamer was recovered some six months later. In 1906, the Mataafa was rebuilt at a cost of nearly $100,000, but it resumed a long career on the Great Lakes. 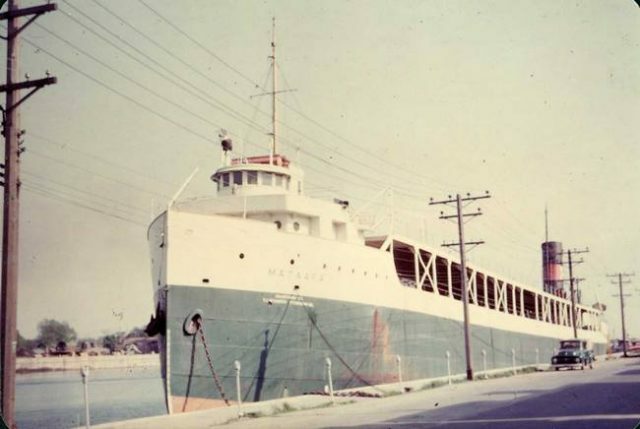 In 1958, The Nicholson Transit Company purchased the Mataafa. They fitted out the 60-year old steamer into service as an automobile carrier able to carry 500 vehicles from Detroit to Buffalo route. The Mataafa exchanged hands several times before purchased by Marine Salvage, Ltd. in 1965. That same year, Mataafa passed down the Welland Canal under her own power for the last time. On July 19, 1965, the Mataafa arrived at Hamburg, Germany to be scrapped at the shipbreakers, ending its career. 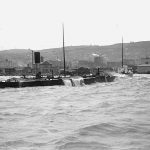 Even though the tragedy of the late November storm of 1905 was infamous to all along Lake Superior, it has been known ever since as the “Mataafa Storm”.